During the summer Steam sale, I figured I’d buy one medium-priced game– either Bioshock Infinite or Remember Me. Both apparently feature mind-benders–multiple worlds and modifying memories, respectively. But BI sounded like most of it was a repetitive shooter, while RM has parkour. So Remember Me it was. So far it’s awesome. With frustrating bits. It’s kind of tacky when reviewers do this, but still: RM is like the parkour from Mirror’s Edge plus the melee combat from Arkham City, plus the futuristic weirdness of Deus Ex. You get various new abilities as you go, and unlike most games, RM actually explains this: you are a “memory hunter”, a criminal who steals memories, and you’ve been caught and memory-wiped. Only it didn’t entirely take, so you keep getting back some of your former abilities. It’s a nice way of making your character powerful, yet have a reason to have everything explained to her. The combat feels like Arkham City even when it’s not: face an enemy to hit, RMB to block, evade a lot, build combos. (You evade with regular movement or by jumping, which I have to adjust to.) The clever bit is that you can architect what the combos do– e.g. you can have one focused on takedowns, one for regaining health, one for reducing the cooldown on your more devastating superpowers. The parkour is a little more directed than Mirror’s Edge— which is frustrating sometimes, as it’d be fun to make your own paths. No zip lines, though. (There are some optional (but strongly recommended) upgrades you can get by exploring just a bit though.) The moves themselves don’t require precise timing, but there are various environmental puzzles (e.g. part of the path may be intermittently electrified). 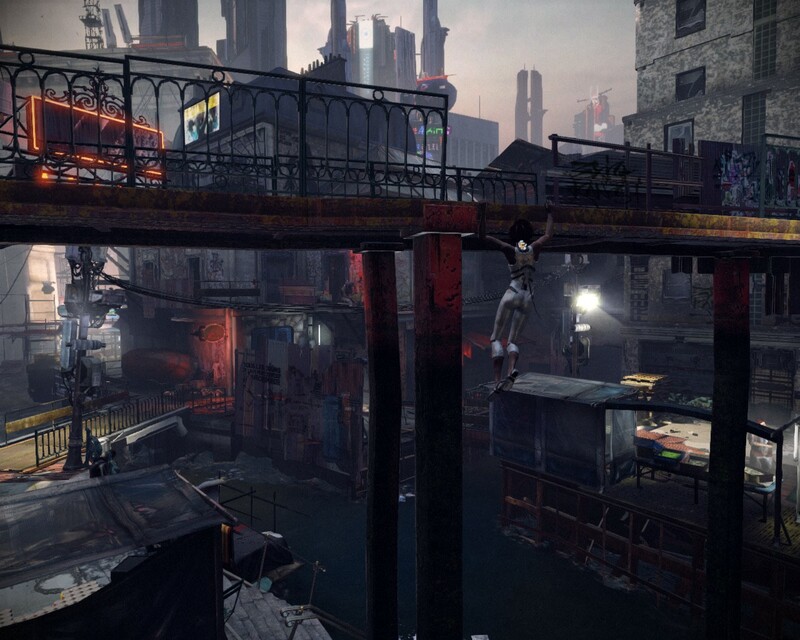 The game depicts a society where memories can be extracted, lost, bought and sold, and stolen. The heroine, Nilan, has a further superpower: she can change people’s memories. When this happens, you basically get a replay of their memory, and you can go back and forth looking for details to change, which will change how the scene plays out. It’s pretty neat, though you don’t get to use it much. It’s also really gorgeous, in its dystopian way. I take screenshots all over just because it’s full of fascinating vistas. 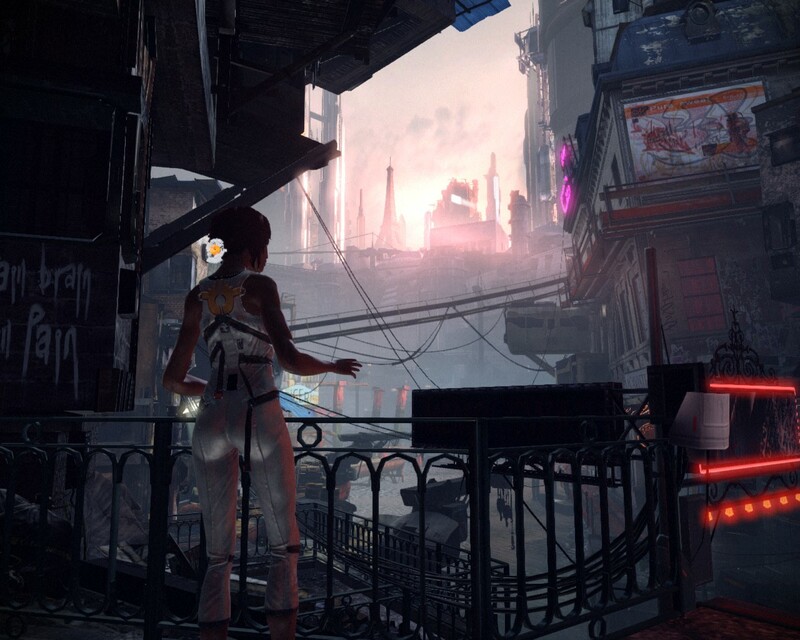 I wish it allowed more interactive exploration, in fact… there are some great little details, like a typical apartment of the year 2084, or a bustling market, or the red-light district featuring sexbots, but most of the spaces are somewhat dead. You can’t buy anything at the stores or talk to the androids or check out the TVs. Anyway, it’s really quite distinctive, and it’s keeping me up way too late. Edit: Later thoughts: Next, even more, final.